Jóhannesson also delivered a lecture at St. Petersburg State University during his visit. Icelandic President Guðni Th. 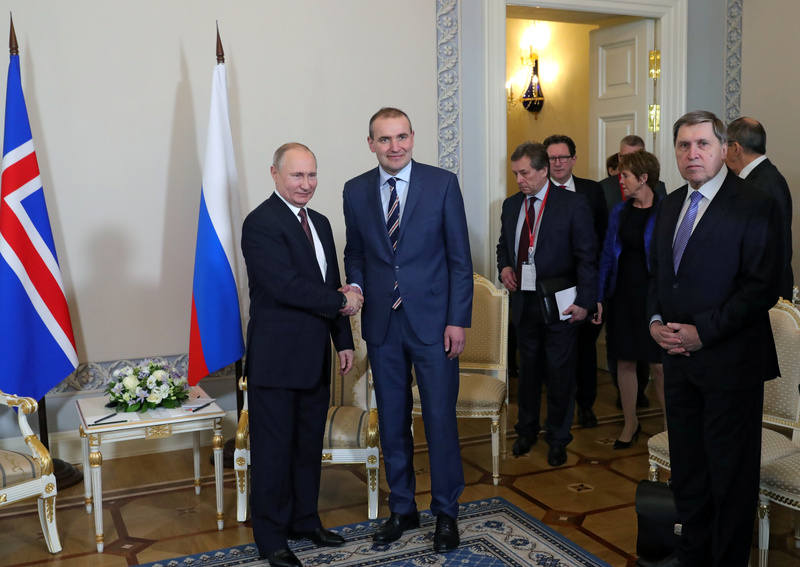 Jóhannesson met with Russian President Vladimir Putin in St. Petersburg, Russia on Wednesday, on the sidelines of the fifth International Arctic Forum, which opened there on Monday. The leaders appear to have gotten along well. Jóhannesson addressed conference guests in Russian, to the delight of Putin, who shook hands with him following the speech. Iceland has chaired the Nordic Council of Ministers since the beginning of this year. Putin described Russian relations with all the countries on the council as good and constructive. “I hope that the positive experience we have amassed will enable us to move forward and on, despite the difficulties that we mentioned yesterday, including during the working lunch,” Putin was quoted as saying on the official Kremlin website. It is not clear from the transcript what difficulties he was referring to. “When difficulties emerged, we could overcome and solve them, but there is one thing that always united and continues to unite us: the Arctic has not disappeared anywhere,” Jóhannesson remarked. “I think that our work at the forum yesterday, alongside other colleagues and heads of other Nordic countries, as well as our discussion of important matters at yesterday’s working lunch were all very important and demonstrated once again that we need the Arctic – territory of dialogue,” he continued. Jóhannesson’s schedule yesterday included a visit to St. Petersburg State University, where he gave a lecture he called, “‘We all protest!’ Di­versity, Crit­ique and Freedom as the Essence of Historical Rese­arch.” The university has a respected department in Nordic studies, established in 1958 by scholar Mík­haíl Ívanovít­sj Steblín-Kam­enskíj, known for translating Sagas of the Icelanders into Russian.